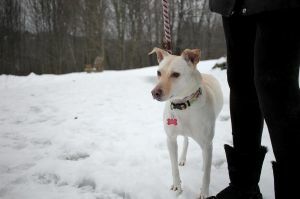 Hi My Name is BELLA and I am a gentle, sweet 5 year old FEMALE SHIBA INU MIX with a gorgeous White and Cream colored coat. I am full grown and petite, weighing just 38 pounds. I was lucky to be rescued from the Illegal Dog Meat Trade in Thailand and am grateful for a second chance. Despite my less than ideal start to life, I hold no grudges against humans and in fact am NON-AGGRESSIVE and love to give hugs. My foster mom says I’m very low maintenance as I am completely HOUSE-TRAINED and can entertain myself for hours playing and throwing my squeaky toy up in the air. I also think car rides are fun. I would love to be part of a family that understands that I am cautious when it comes to unexpected noises, big cities, and young children. I can be a bit shy when meeting new people, so I might hide behind my foster mom when you first come visit. But please give me a chance, and come visit me a few times; I promise to be your most loyal buddy once I get comfortable (just ask my foster mom!). I am living in a foster with another DOG and CAT and I get along with the dog and ignore the cat, so will be okay in a home with either or both types of fur siblings (but not with young humans).